Mortgage rates have been heading higher for the last month. Have we reached the bottom of rates for this cycle? A couple of weeks ago, I noted that Bond Market Selloff Makes Mortgage Rates Rise. Many expected the knee-jerk market reaction to be reversed and the downward trend in interest rates to resume. It doesn't appear to be working out that way. Have interest rates bottomed for this cycle? The 30-year, fixed-rate mortgage spiked to the highest point in five months, up 20 basis points to 4.5% from the week prior, according to the Zillow Mortgage Marketplace weekly update. This is the second consecutive week the rate increased. Zillow said the current 15-year, fixed-average rate is 3.89% and the rate for a 5-1 adjustable-rate mortgage is 3.1%. That type of mortgage maintains a steady rate for five years and then is adjusted annually thereafter. Regionally, 30-year rates vary, but the majority of states witnessed a dramatic inflation. Massachusetts' average rate spiked to 4.61% from 4.3% prior. Rates in California also increased substantially to 4.47% from 4.32% the previous week, while New York's rate increased to 4.53% from 4.31%, and Texas saw its average rate rise to 4.44% from 4.24%. The current rate in Washington increased week-over-week to 4.5% from 4.24%, as did Illinois' rate, up to 4.4% from 4.23%. Rates in Florida are up close to the national average at 4.48% from 4.33%, and rates in Pensylvania rose to 4.43%. Colorado's average rate for a 30-year FRM decreased one basis point to 4.47%. Zillow bases its averages on real-time mortgage quotes from lenders registered with the company. The national average comes from thousands of daily quotes by anonymous borrowers through the Seattle-based company's website. About a month ago, I wrote Low Interest Rates Will Not Create Demand. Each week as I write posts, I check the current interest rate to calculate the total cost of ownership. If you look back through the archives, you can see what the bankrate.com published interest rate was for that week. A month ago it was 4.29%. The low was 4.21%. Last Friday, the rate was 4.71%. That represents a 12% increase in borrowing costs in a little over a month. Since the mortgage payment is by far the biggest cost of ownership, rising interest rates take their toll on afffordability. That will also put pressure on prices. It's like home buyers today are suffering from post-traumatic stress disorder. The housing crash, foreclosure crisis and banking scandals have all combined to make buyers more sensitive than ever before. That's why the slightest fluctuation in mortgage interest rates have huge emotional power today. OK, if I buy today, the buyer who wants to purchase the house from me in the future when I am ready to move may not be able to borrow as much money. Won't that make my house harder to sell, and might I have to lower the price — a great deal — like the $100,000 mentioned in the example? Isn't the fact that my take-out buyer is going to be much less leveraged working against me? We all know the answer to those questions (Your Buyer’s Loan Terms), and that was when I had an epiphany: the realtor mind is unconcerned with reality, it is only concerned with urgency, and if urgency conflicts with reality, urgency wins, and buyers lose. Buyers are supposed to believe the realtor cares and that they are looking out for the buyer's best interest; beliefs wholly incompatible with a realtor Mind®™ that places urgency over honesty. "I think some people get a little fearful of what the higher payment might mean to them but they don’t' realize how minimal the difference might be," notes Eric Gates, President of Apex Home Loans in Rockville, MD. 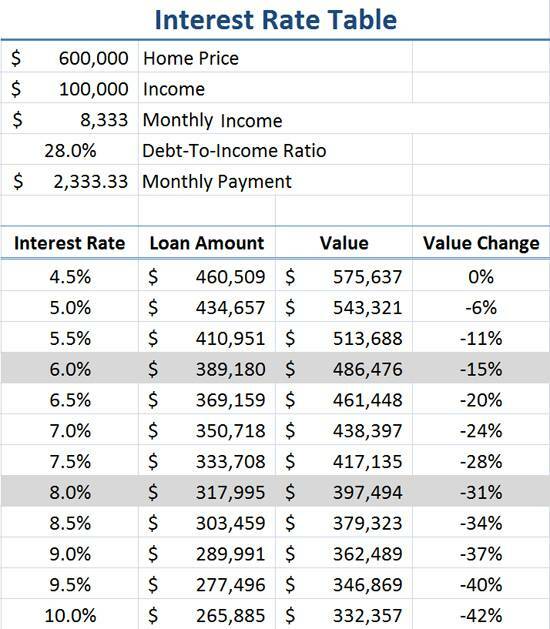 In fact, Gates did a little math for me on the change in your monthly payment at different interest rates, if you buy a $200,000 home (just above the national median) with 20 percent down. "Keep in mind that difference is mainly interest which is tax deductible. So, someone paying an extra $24 a month in interest who is in a 25% tax bracket is really only paying an extra $18 a month after the tax write off of the extra interest," Gates adds. Yes, cutting the mortgage interest deduction is currently being debated as a deficit-reducer, but the proposal is to reduce the cap from $1 million to $500,000, so it's not going to affect the buyers I'm using as an example here. The fact is that we're talking less than $100 a month, for a full percentage point increase. Wait just a minute. Early in 2009, I explored the impact of rising interest rates in 4.5% Mortgage Interest Rates? Since most people finance to the maximum allowed by a lender to get the most expensive home they can acquire, the it doesn't matter if the payment differential is small, any change is going to impact the total amount of the loan. That is what impacts house prices. As has been pointed out in the comments, the impact of rising interest rates will be felt most where affordability is a problem. Right now in Las Vegas, the low end is trading 30% to 50% below rental parity. If interest rates go up, current price levels are still very affordable. People do not need to reach for the starts to buy what they can rent. The same is true in areas that did not bubble and continue to enjoy relative affordability. Contrast that to Orange County were the fringe of the market were prices are estaablished is pushed to the maximum limit of income affordability. In that circumstance, rising interest rates will reduce loan balances, and the weight of inventory will cause prices to fall to the new lower limit of affordability. Obviously big cities or in-demand housing markets, where home prices are far higher than the national average, will see bigger jumps in their monthly payments, but if they're able to afford the higher priced home, the change in monthly payment would likely be comparable in its impact on their overall budget. The problem is that people in high prices areas like Orange County cannot afford the higher priced home. They never could. So why, then, do mortgage purchase applications fall every time rates go up slightly and the opposite when they go down?? The answer is that it is largely emotional. Home buyers seem to ignore what they can afford and focus instead on what they think they somehow deserve in today's badly beaten market. "Instead of focusing on what's my payment going to be, they see that their friend got 4.25 and they want that same rate and 4.5 isn't 4.25 and they think 'that's not good enough'," says Gates, who has seen that happen more than once. Fear of unemployment also looms large, so buyers are much more careful with monthly payment calculations, even trying to make sure that if they are out of work temporarily they can still make the payments and not go into default. People should not be focused on what their payment is going to be. That is part of what got us into this mess. Option ARMs made sky-high prices affordabie on a payment basis. Albeit temporarily. So what do you think? Have we seen the bottom of the mortgage interest rate cycle, or will we see under 4% mortgage interest rates? Take the free money. What could go wrong? Borrowers took the free money offered to them by banks for the appreciation of thier house. Many thought, "what could go wrong?" Real estate always goes up, right? Who is to blame for borrower stupidity? Many who want to see the banks come to ruin are portraying the borrowers as hapless victims of predatory lending. This assertion is only half true. Lenders did indeed induce borrowers to take on excessive debts. Lenders did not do this to profit from the foreclosure — those have been big losers — but to profit from the origination fees. The idea that borrowers are somehow blameless in this matter is the part that irritates me. Borrowers knew it was a loan. They knew they were borrowing hundreds of thousands of dollars they would need to pay back. Many of them believed the house would pay it — or more accurately stated, the future buyer of thier house would pay it. But whatever foolish beliefs borrowers had, they were still responsible for taking out the loans. They borrowed all the equity from their houses and spent it. When people make such a foolish mistake, the consequences are foreclosure and bankruptcy. Life goes on. The owners of today's featured property bought back in 1992. After 18 years of loan ownership, they lost their house in foreclosure due to their excessive borrowing. Do you think they will learn their lesson, or will they blame the banksters or the housing market gods? Human nature being what it is, some will take responsibility for their actions, but most will play the victim and blame someone else. This property was purchased on 5/29/1992 for $207,000. The owners mortgage information is not available, but it was likely a $165,600 first mortgage and a $41,400 down payment. On 10/15/1998 they took out a stand-alone second for $37,500. On 3/1/2002 they refinanced with a $252,000 first mortgage. On 7/1/2004 they refinanced with a $315,000 first mortgage. On 7/14/2006 they refinanced with a $400,000 first mortgage. On 11/13/2007 they refinanced with a $429,000 Option ARM. Total mortgage equity withdrawal is $263,400. Total squatting time was about 19 months. The property was purchased at auction on 10/29/2010 for $390,000. The flipper wasted little time getting the property on the market. Complete Turnkey Property!!! 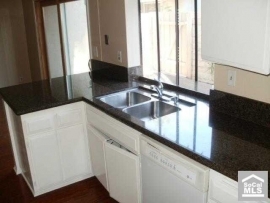 Charming And Private End Unit With 3 Bedrooms, 2 1/2 Bathrooms, New Carpet And Paint, Granite Countertops, Hardwood Floors And A Serene Back Patio Setting. This entry was posted in Library, News on December 8, 2010 by IrvineRenter. I’d like you to caveat this statement, “Since most people (in IRVINE, or CA) finance to the maximum allowed by a lender to get the most expensive home they can acquire,” Financing to the hilt is not universal, as your previous post about median home price to median income ratio showed. Some areas have people stretching much more than other areas do. Where people are stretched, interest rates will have a first-order impact on prices. Where people are not stretched it will not. I 2nd the notion that not all parts of the country stretch to buy the most expensive house that they can afford. If they did, there wouldn’t be 2000 sq ft, $200k homes in many areas of the country, they’d be building 4000 sq ft $400k McMansions instead because everyone would stretch as high as they could. Interest rate changes should have a very different impact in a $200k median home area than in a $600k median home area. The $200k area sees the payments go up by $100 a month, vs $300 a month in the $600k area. Plus the buyers in the $200k area aren’t spending 50% of their income on housing, so they have some room to manuver. I think people self-select. People who aren’t comfortable paying massive amounts of their income towards a mortgage don’t move to the most expensive areas. With that, attitudes towards paying > 33% of income to housing seem normal. I don’t know what type of regulations can be taken to avoid this clustering behavior. The average down payment in Coto de Caza for the last year is 42%. is that *all* purchases, including the lender owned foreclosure? I posted comment with a link to the data, but IR has to approve the link. Yes, lender owned foreclosure sales are included, but not sales at foreclosure auctions. And I misspoke the 42%. It is closer to 38%, but I was speaking from memory. Sorry. What is fascinating is how few ‘less than 20% down payments’ there are since January. I have to admit that even I concede that the Orange County market has had a lot more strength than I had imagined. I purchased a house 3 months ago. It needs lots of work, but has good bones. A house 3 doors down just went up for sale 400K higher 2 weeks ago and just went pending. It was in pristine condition, but very similar size/lot/characteristics, albeit with most things updated and working. So as long as you spend less than $400K on upgrades you come out on top! There is a 10 year auction today and the yield on the open market is now at 3.28%. What does the open market know? US Treasuries suffered their biggest two-day sell-off since the collapse of Lehman Brothers, following a torrid month that has seen borrowing costs for western governments soar. Germany, Japan and the US have all seen their benchmark market interest rates rise by more than a quarter in the past month while the UK’s has risen by nearly a fifth. The yield on 10-year US Treasuries hit a six-month high of 3.33 per cent on Wednesday, up 0.39 percentage points from Monday and 1 percentage point higher than its October low. Before we get the usual objections to mortgage modifications, I need to remind readers that in the old fashioned days of banking, when bank kept the loans they made, it would be unthinkable NOT to modify a mortgage or any other loan when a borrower got in trouble, assuming the borrower was viable. “Viable” means that the borrower still has enough income to pay enough that the bank still comes out ahead by modifying the loan rather than other recovery strategies, which for a mortgage loan means foreclosure. banks can and should modify, sans govt subsidy. Ummm, no they wouldn’t…they would have had enough equity in the asset they had lent money against and would have foreclosed as quickly as legally possible…at least that’s what we did when I was a banker. Who are you kidding? A college degree isn’t a free pass on the OC stupid meter. I’ve seen madness across the board! Bellinos will probably announce a new loan mod in a day or two, thanking the amazing people that helped them out. Life will go on as before in Newport Coast. Perhaps a camera crew will document their festive celebration at an exclusive restaurant. Meanwhile, renters will spend five minutes at the market staring at a jumbo bag of salad greens, wondering if all can be eaten within a week so none is wasted and value is there. Yeah, I’m one of ’em. It’s just another day in Southern California. That pefectly sums up OC. As a reminder, one of the main reasons why The Ben Bernak did QE2 is to keep mortgage rates low. Sorry Benny, it ain’t working! Well Bernak, after 6-8 years of extremely low interest rates, everyone (that could) in The OC has already refinanced or HELOC’d the hell out of their home. Look, I agree that borrowers are not blameless. BUT – who’s money was it? As my dad used to say, “Be 100% sure you will be repaid, otherwise consider it a gift.” So, Mr. Lender, were you really 100% confident you would be repaid on a no-doc, stated income, negative amortizing, zero down mortgage? If so, you deserve to take the hit because you are a fool. Originating lenders didn’t care. The debt was quickly securitized and sold off to investors. Everyone took their cut along the way and didn’t really care if it ever was paid off since someone else would be left holding the bag if the borrower defaulted. They also didn’t care because the collateral was rising in ‘value’ faster than the interest rate on the loan. If someone defaulted, they’d either sell and make money or refi. Either way the first lender did OK. That was based on the assumption that home prices never fall and always have near double-digit increases. The problem with the higher rates pushing prices lower scenario is that it’s not proportional. If rates rising a full point makes you afford $100k less house, will sellers really lower their homes $100k in response? The psychology of a seller is more stubborn than that of your urgent realtor. If the buyer can not qualify, it matters not one whit what the seller’s psychology is. Interest rates directly and profoundly affect how much buyers may qualify for. And the buyer pool does not increase as interest rates rise, and neither will their income. 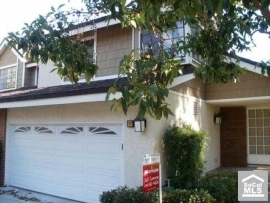 You can discount seller psychology all you want… but the still high prices in Irvine and other areas shows that there is some merit to it. Remember… bubble pricing in premium areas has little to do with fundamentals. FCBs with 100% down don’t care what the interest rate is. And you missed my point. I’m not saying that prices will not drop — I contend they will not drop **proportionately** to the rise in interest rates. You are right. They will not drop proportionally. Prices will drop MORE than could be accounted for by interest rate increases, because along will a rise in interest rates is a rise in the prices of necessary commodities which will increase the cost of living without a commensurate increase in wages resulting in less spending on housing. Whoah… easy with the stone soup. Obviously other things will cause prices to rise or fall, but in isolation (and in my opinion), interest rates do NOT have the proportionate effect some of you say they do. By the way, why the smear on the urgency of realtors? Don’t real estate fund investors have the same urgency? Buy in now while rates are low so that we can create a higher margin on cash flow? Nothing is in isolation. The non-recognition of cause/effect and the multitiude of factors affecting market prices are why so many think that forecasting is mumbo-jumbo. It ain’t easy, but forecasting with inclusion of multi-variables is possible and more accurate. If you don’t think that is gonna show up in your grocery bill soon, well … good luck to ya. Don’t tell me… tell IR. He’s the one who talks about interest rates, shadow inventory, foreclosures, HELOCs, and prices. I don’t see you riding him to include commodities in his blog posts. Note to self: Invest in bacon, t-shirts and oatmeal. So exactly what % of the cost of cereal is the corn that actual goes into it? Not sure if it is true or not but it what was quoted. So its up 14%? Then as a % of cost, it would be .1014 cents now. if that is passed through straight to the consumer, then it would actually be less than 1.1% in CPI. More directly affected by all your suggestion of commodity inflation is the building cost of real estate. Those material costs are a much bigger % of the price of a finished product than corn is to cereal. If home prices keep doing down because interest rates are higher but material costs continue to rise because of inflation, what is going to give? As the housing stock wears down, who will replace it when no one can make any money building it and selling it. As the stock decreases overall, (ie, supply shrinks), RE prices will follow higher. Also, corporate profits are at all time highs. You think that wage inflation isn’t going to follow along with it? highly unlikely. That doesn’t mean that the unemployment rate will drop as that has more to do with skills of the workers. (IE college grads have under 5% unemployment rate). But wage inflation will follow shortly. Too bad the govt doesn’t use any of that info to determine (CORE) inflation. Not only that, they use this stupid thing called “Hedonics” which distorts prices even further. Example … say a car manufacture keeps the price of a SUV the same as last year, but decides to add a few options to entice more buyers (MP3 Jack, Sun Roof, etc), the govt considers that to be a price DROP, therefore canceling other increases in things like housing. True, the corn itself is a small part of the cost. But all the other components of the cost are going up too. Paper costs go up, so the box costs more. Ink is oil based, so oil prices going up make the printing of the packaging more. Energy costs drive up the cost of running the factory, and increases the cost of transportation for getting it to the market. Once it is on the store shelves, the cost of energy that the store uses affects their pricing because they still need to make their margin. Something isolated like a bad corn harvest doesn’t affect the price of a box of cereal much, but a broad based increase in all commodities does affect the cost of the product. no doubt. The main point was that there are a ton of immediate costs beyond commodities that determine the price of food products in general. COGS for a food company like Kellog is 55 to 58%. in 2007, Toll Brothers COGS was 89%. Who can better survive component increases without raising prices? What will be more impacted by inflation of commodities? wage inflation is a tough sell in a major economic contraction. inflation will put upward pressure on wages eventually though. who was bashing jim rogers over the years on this blog? hello? How did a blog post about rising interest rates turn into a break down of Frosted Flakes? Is that like the Butterfly Effect? What are those rates compared to the last five YEARS? Or ten years? We all need to cooperate with BHO and the Feds Repeat the montra: There is no inflation. There is no inflation…. We must have the bailout to prevent a financial melt down. Deflation must be prevented at all cost (to the taxpayers). Quite a few FCBs are buying homes in premium areas well over the $1M+ range. A price decline in those premium areas will result in droves of them being even more active and aggressive. the next ten years based on homebuying patterns. I think a lot of current and future sellers aren’t understanding the math and are going to be very pissed off. If rates get back to more historic norms, an entire pool of potential buyers in OC will be effectively swept away. Sellers will HAVE to lower their prices. The other thing is that there are quite a few people in OC who are at, or approaching retirement age. Some of the “approachers” still have to drum up a lot of cash to pay for their kids college (and holy crap, have you seen the increases in the cost of higher education the last 5 years!). Some just want to downsize. There’s going to be mushroom clouds of anger around the county when rates continue to rise. There’s a lot of homes in trouble who can’t sell at lower prices. But there’s probably a considerable number of people who want to sell, but are unsatisfied with market prices in OC right now and somehow think prices will rebound back to the crack-smokin’ levels of 2005 without improvements in the job market, economy and state budget situation. They are dreaming. Those that sold their homes at OC market peak price back in 2006 – man, did they made out like bandits or what? Unless they are forced to move for reasons such as family, relocation/job loss, etc. Over time, the % of owners that HAS to sell will increase. Meh, buyers won’t even really notice until the number starts with a “5”, and even then that’s a historically low rate. Thanks, Geotpf. Good commonsense reminder. This is another Long pin in the Real Estate Voodoo Doll. Bonds and Interest Rates. Looks like the Chinese are going to demand higher rates now that we “kicked the can” on our huge deficit. Those low interest rates are going to move in the near future. The 2 yr moved up 16%. 5 yr 9%. 10yr. + 4.6%. Thats just for Today. By this time next year maybe double digit ? Ouch. This country better get its head out of the sand and have a plan to trim these deficits. Or this is going to get way worse real quick. Wait till the vote to raise the debt ceiling. Thats going to be interesting. Vote NO and we default. Think about it. If somebody gets a fixed rate mortgage from a bank now, can the bank increase the rate on it in the future when inflation heats up? Why would a bank lend at 5%, when inflation is at 15%? The bank makes it’s money on the spread. The bank borrows at 0.25% short term and then loans to you at 5% for 30 years. they wouldn’t. The average duration of a 30 year fixed rate mortgage is about 7 years. In general, inflation helps debtors at the cost of lenders. Banks will get crushed if inflation is really 15% because their cost of funding that mortgage will skyrocket. That is why banks are traditionally not good holders of 30 year mortgages. There are other investors who liabilities better match the longer duration of the assets they are buying such as mortgages such as pensions and life insurance companies. Banks are better at originating, servicing and holding on to the short duration segments of mortgage pools. This is why securization is such a powerful mechanism. It lets you dole out products that fits the needs and the matching durations of the buyers. Who are the holders of these 30-year mortgages? The government agencies that are almost bankrupt, the government itself which is not far from a default, stupid Chinese investors? In other countries, banks rarely if ever offer fixed rate mortgages. Partiall yes, yes and yes. As well as stupid people like Pimco’s Bill Gross and Blackrocks Fink. What is more interesting is that people think the Chinese are investing in the US debt market to make a return on their investment and so they will demanding higher interest rates and blah blah. The Chinese buying USD bonds is a direct result of their pegged currency to the USD. Where else are they going to hold all those dollars? At citibank? in the stock market? Basically to keep their currency controls in place, they have no choice but to keep buying USD bonds. They are normal investors seeking a return on their investment as a primary objective. I’m sure they don’t want to lose money but they have few other choices to park 1.5 trillion dollars. Net, the Chinese have been selling US treasuries for months and they have been buying commodities. The idea that they few places to park their money is US/ego centric and fallacious. Because they are net sellers for a few months, they are going to put the bulk of their funds in other places? And what does the largest, deepest, most liquid market in the world being the bank that someone with 1.5 trillion puts their money for holding have to do with ego and US centric? It’s a really smart idea to help drive up commodity prices when inflation is already running too high in China who is the worldest largest buyer of commodities. better to buy something going up in value (with inherent value) than something going down in value. Freddie Mac and Fannie Mae and they securitize them and sell them with government guarantees. BTW The Fed recently surpassed China as the holder of most US debt. Saw that, and my guess, along with many others, is the the UK purchases are actually the Fed or Fed backed through swaps. All in all, China has stopped buying, exactly the opposite of all those who think that the US is the center of the universe and other countries can not survive without our trade and dollars, and we are buying our own debt with money created out of thin air. We’re going to see some of the fence sitters jump into the pond. Anyone in negotiation on a property, haggling about a $1,000 fence repair cost is going to keep a sharp eye on their 60 day rate lock expiring. They’ll “clear the deck” and close ASAP. The big question is “Now what?”. I’ve long believed that once the population gets a taste of sub reality rates, they’ll never go back to anything else. Witness where auto loan rates have been hovering around since 2001. Anything over 0.00 is a non starter for most. Same with housing rates. Motivating buyers to purchase before they get priced out due to rates (forever..) is the oldest con around. It’s the champagne of nonsense from the Realtor community. Expect nothing else. As to the mortgage industry, that sound of crickets is also the sound of layoffs. Sure, there’s plenty of people still able to refinance, but with the mushrooming refi companies (Greenlight, CashCall, etc) wondering when the next phone call is coming in reminds me of 2005. We just finished a great refi boom from 2003-2004. Rates came up a bit, so out came the exotics – 100% financing, stated stated NINJA loans. That ship has sailed and ain’t coming back. The second wave of exotics were the loans that submarined the industry – 1.0% Option ARMS. They ain’t coming back either. So what do you do with a room full of processors and silent phones? You raise the unemployment rate a few percentage points. It’s Gar-on-teed to happen…. unless The Ben Bernank comes out with a banzai run into Mortgage Backed Securities to push rates back sub 4.25%. PIMCO loaded up on MBS’s over the past 60 days. perhaps they see Helicopter Ben readying a Divine Wind attack soon. Actually if they don’t buy them, their currency starts to rise against the dollar and their export market collapses. They really don’t want 1 billion pissed off unemployed people so they have little choice. They have to keep selling stuff to us and that means it has to be cheap. You ask: Have we reached the bottom of rates for this cycle? Now with the Interest Rate on the US Ten Year Note, $TYX, moving progressively higher, real estate shares are turning lower as the entitlement to value real estate at manager’s best estimate rather than at market has been terminated. The Interest Rate on the US Ten Year Note, $TYX, rose 0.38% higher today, causing bonds, overall, BND, to fall sharply 0.52% lower, and the Mortgage Backed Bonds, MBB, to fall 0.32%. Needless to say, today, December, 8, 2010, it was a slaughterhouse in the bond market with those invested in bonds getting slashed left and right. The End of Credit commenced November 4, 2010 with higher interest rates and falling currency price. The world tipped from the “age of debt liquidity” …. and into “the age of debt deflation”… where there has been disinvestment from Emerging Markets, EEM, Asia Excluding Japan, EPP, Utilities, IPU, and diversified utilities, CNP, and Junk Bond, JNK, emerging market bonds, EMB, international corporate bonds, PICB, World Government Bonds, BWX, short duration corporation bonds, LQD, as well as total bonds, BND. It was on November, 4, 2010, bond vigilantes called the Interest Rate on the US Ten Year Note, $TYX, and the Interest Rate Higher on the 30 Year US Government Bond, $TNX, higher as Ben Bernanke’s QE2 constitutes monetization of debt. The anticipation of Quantitative Easing Two created a liquidity trade, that was a safe money trade, a money good trade. But investors sold Ben Bernanke’s actual announcement of QE 2. And it was on November 4, 2010, that the currency traders followed on the heels of the bond vigilantes and sold the world’s major currencies, DBV, and the emerging market currencies, CEW, causing the US Dollar, $USD, to rise. In summary, it was debt deflation, that is currency deflation, seen in DBV and CEW, stimulated by rising interest rates, that turned emerging markets, EEM, Asia Excluding Japan, EPP, Utility Stocks, IPU, and Total Bonds, BND, lower. Of significant summary note, world government bonds, BWX, fell lower on today’s falling major currencies, DBV. And emerging market bonds, EMB, fell lower on today’s falling emerging market currencies, CEW. I believe that the Morgan Stanley Cyclical Index, $CYC, ^CYC, which is the “investment of risk”, that is the investment of global economic expansion, which is currency trading driven, is going to turn lower very soon, most likely tomorrow, December 9, 2010, on carry trade disinvestment. ..Respondents see the recession and job losses as the main reasons for the foreclosure problem, a shift from last year when they were more likely to blame homeowners who bought homes they could not afford.